This cake is iced in black. 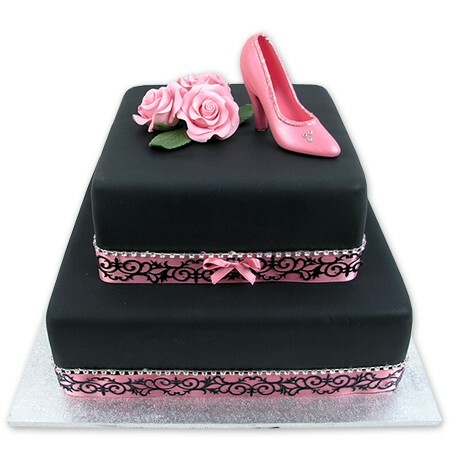 Decorated with a satin pink and black ribbon and a string of diamantes at the base. On top, a pink satin bow, 3 pink sugar roses and a black porcelain shoe on top. This attractive two tier cake is fully iced in black on both tiers. It's surrounded by a satin pink and black ribbon and a string of Diamantes at the base of both tiers. The top tier is finished with a pink satin bow at the front of the cake, and 3 pink sugar roses and a black porcelain shoe on the top.